Fagus grandifolia is a tree to 30 m tall; may live 200 years; slow growing; growth pattern determinate (a single bout of stem and leaf growth early in season) (Marks 1975); shallow rooted; often colonial by root sprouts, especially if primary tree is injured; roots associated with ectomycorrhizal fungi, such as Lactarius cinereus (family Russulaceae, Basidiomycotina) (Berliner and Torrey 1989; Bills et al. 1986; McKnight and McKnight 1987); bark silvery, smooth; winter buds narrowly lance-shaped 2-2.5 cm long, sharp-tipped, scales eight or more, overlapping, golden-brown, stipule scar almost encircling twig end (Harlow 1946). Leaves alternate, stalk 0.3-0.8 cm long; blade 5-12 cm long, 2-6 cm wide (Dirr 1990), oblong to egg-shaped, tip long-pointed, base wedge-shaped, dark bluish-green above, paler below, often with tufts of hairs in vein axils, margin coarsely, sharply toothed, veins 9-14 pairs, often persistent into winter, becoming tan-gold; leaves expand mid-May; winter plant leafless 174 days (Britton 1874). Flowers small, monoecious, in small clusters, male flowers in catkins female flowers very small; blooms April-May. Fagus grandifolia.fruit.Kevin C. Nixon.www.plantsystematics.org. (Accessed 9/2014). Fruit dry nuts 2 together, about 1.5 cm long, 3-sided, slightly winged, in a short-prickly husk about 2 cm long, Oct.-Nov. Nuts eaten by many birds and mammals, buried by squirrels, and blue jays (Darley-Hill and Johnson 1981; Johnson and Adkisson 1985). Blue jays (Cyanocitta cristata) can disperse beech seeds up to 4 km or more, potentially recruiting seedlings into relatively distant forest fragments. This is important as forests become more fragmented since blue jays are common in disturbed, suburban and urban habitats. Blue jays collect and disperse green, sound, viable seed almost exclusively (Johnson and Adkisson 1985). Seeds apparently do not persist more than one year in the soil seed bank (Hughs and Fahey 1988). Habitat: Maturing and older forests. Swamp forest edges to upland forests. Very shade tolerant, index 9.3, (P50 of 500 foot candles) (Bazzaz et al. 1972; Whitney and Runkle 1981). Found in moist, acid soil, pH 4.1-6.5 (Gargiullo, unpublished data). Intolerant of flooding, drought, salt, compaction (Hightshoe 1988). 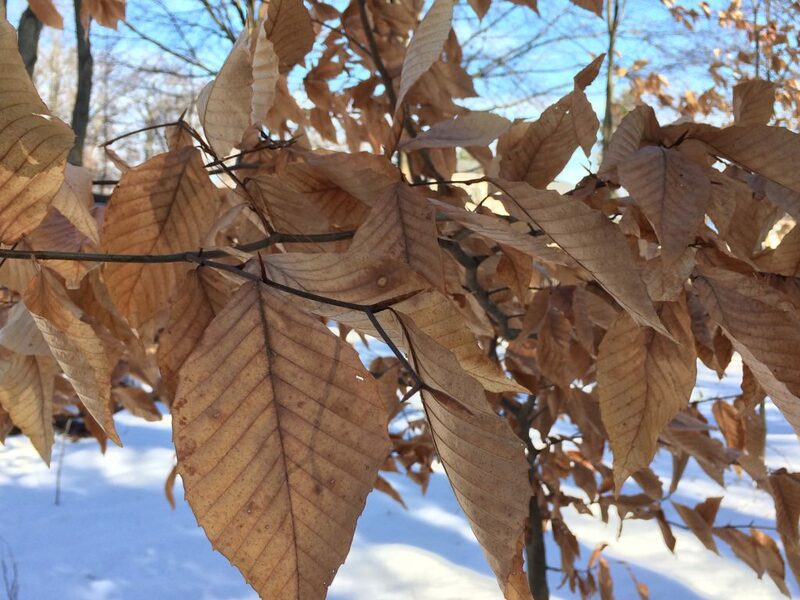 Shade tolerance apparently due to generally low rate of respiration of beech and its ability to respond rapidly to increased light, such as sun flecks, by opening stomata, allowing for photosynthesis. Needs at least 0.5% full sunlight to survive (compensation point) but cannot use more than 30% full sun (saturation point), (Hicks and Chabot 1985). At very low light levels saplings and suppressed understory trees may grow only 5 cm per year, but growth rate increases significantly with 1-4% full sun in forest understory and small canopy gaps. Fagus grandifolia.Neonectria faginata and Neonectria ditissima.beech-bark-disease.In.Defense of Plants.1.10.2013 (Accessed 2016). Notes: Deer browse on twigs (Gargiullo personal observation). Appears to have increased in New York City forests over the past decades (Stalter 1981; Lefkowitz and Greller 1973). Trees may spend up to 80 years in the understory before achieving access to full sun of the canopy (Canham 1990; Poage and Peart 1993). 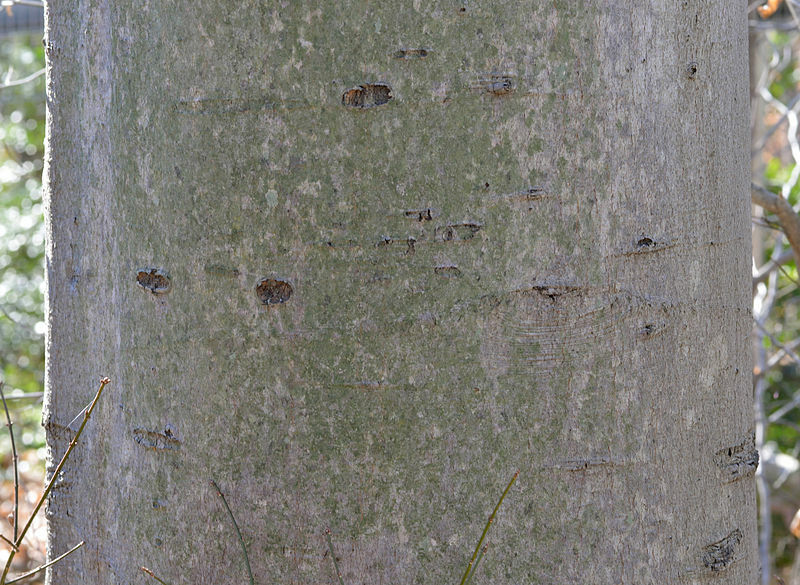 Bark is often attacked by the beech blight aphid (Grylloprociphilus imbricator) which is damaging but rarely lethal. Bark is also subject to frost cracking from very cold weather, fire damage (especially large superficial roots) and attack from many fungi. Beech has thin bark that is especially susceptible to fire damage allowing entry of pathogenic fungi. 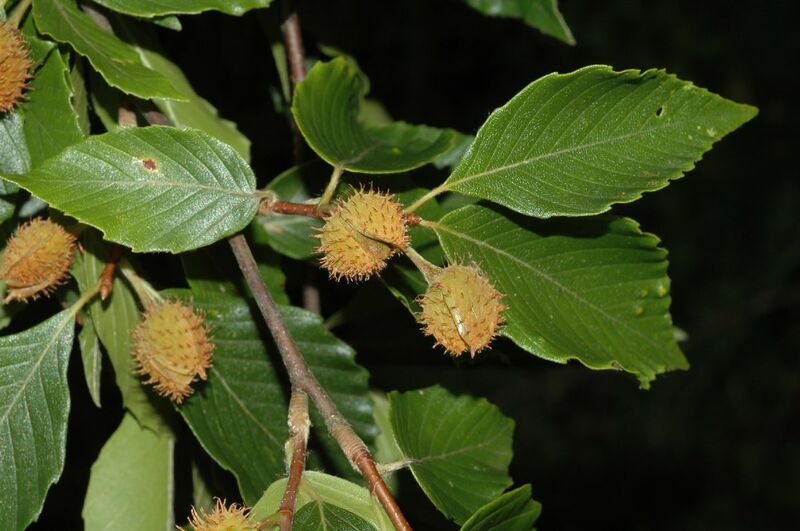 In recent years, losses of beech have occurred due to beech bark disease, Nectria “complex,” a fungus, Nectria coccinea var. faginata or N. galligena (Ascomycotina), transmitted by the beech scale insect Cryptococcus fagisuga (Homoptera). The beech scale was transported from Europe on European beech and was followed by the fungal infection some 30 years later. Ganoderma applanatum (Fomes applanatus), (Basidiomycotina) can cause decay of sapwood in stressed trees. The fruiting body is a bracket fungus, with and reddish-brown top and a white undersurface that turns dark when scratched. Because of this, it is known as the artist’s fungus. A heartwood rot fungus Phellinus igniarius (Fomes i.; Basidiomycotina; Hymenomycetes) colonizes tree wounds already infected by other fungi. The fruiting body is a polypore bracket fungus with a thick, hoof-shaped, blackish cap, often with a white margin when young and brownish pore surface. Another heart rot affecting beech is caused by Inonotus glomeratus (Polyporus hispidus; Basidiomycotina, Hymenomycetes) it often enters on branch stumps which is eventually replaced by a blackish mass of fungal tissue (a conk) in advanced infections, (Sinclair et al. 1987). Beech roots are parasitized by two flowering plants, beech drops Epifagus virginiana, and Squaw-root (Conopholis americanus). 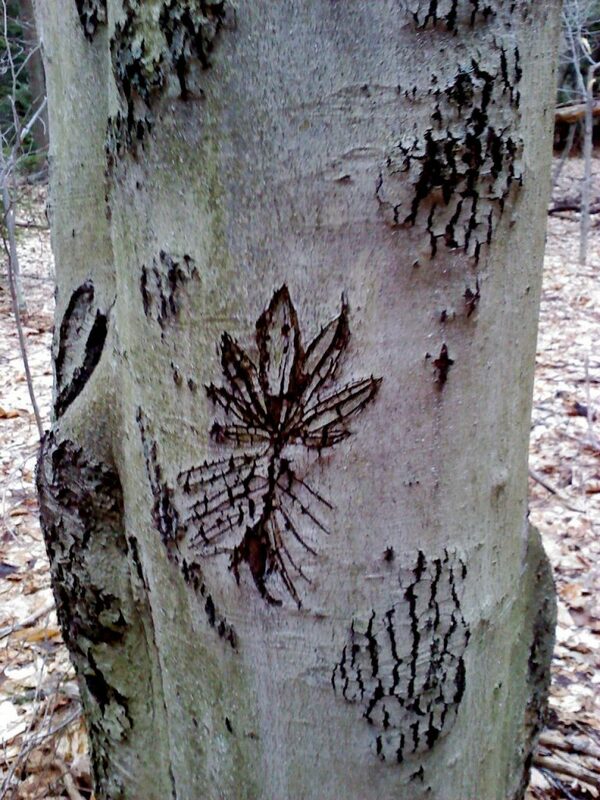 Beech trees are sometimes defoliated by the larvae of the saddled prominent (Heterocampa guttivitta) and other insects (Burns & Honkala 1990; Hightshoe 1988). Mycorrhizal roots often have swellings caused by Meloidogyne haela, a root-knot nematode (Brundrett and Kendrick 1988).